ELMONT, NY – A little over a month ago, Frater Kenny Troutt (Beta-Chi, Southern Illinois Univ.) and his racing partner Bill Casner were dreaming of winning their first Kentucky Derby. 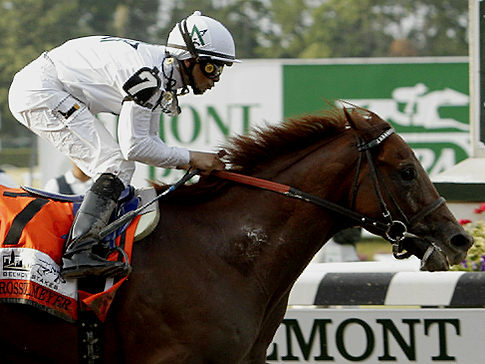 This weekend, the pair took another horse, Drosselmeyer, to victory circle in the Belmont Stakes. The third race in the coveted Triple Crown of horse racing, Frater Kenny won two of the most watched races in the sport. Drosselmeyer, named for a character in Tchaikovsky’s The Nutcracker, cracked the big time Saturday with a gallant Belmont triumph. He was welcomed to the major leagues of thoroughbred racing. The copper colored chestnut didn’t have enough graded stakes money to get in the Kentucky Derby, skipped the Preakness and then finished a distant second to Fly Down in last month’s Dwyer Stakes over this same track. But upsets are part of the furniture in the Belmont, jack-in-the-box appearances down the stretch by a thoroughbred roundly ignored in pre-race analyses. The Winstar co-owners said they were emotionally cool as Drosselmeyer broke from the seventh post and steadily moved up to sixth, then fifth, then fourth. He was third as the final-turn fracas broke out, First Dude trying to go wire-to-wire and heavy traffic clogging up the track. The horse took advantage and galloped past the field to take home the victory. The Offices of the Grand Chapter congratulate Frater Kenny Troutt on another spectacular victory. Be sure to follow the latest TKE News with the RSS Feed, on Twitter or the official TKE Facebook Fan Page (Tau Kappa Epsilon Fraternity). Submit your news today.